Romance and cruising would seem to go hand in hand, particularly if you've spotted any of the cruise lines' advertisements showing photos of couples snuggling at the bow at sunset, or sipping orange juice on their private veranda in bathrobes, or even -- and this one we have a hard time believing -- spending time alone on a deserted beach with their mega-ship anchored in the background. 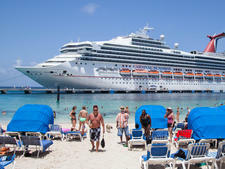 Advertisements notwithstanding, cruising can be one of the most romantic vacation options, but choosing the right cruise line and, even more specifically, the right ship within the fleet, can be a challenge. You don't want that sunset marred by crowds on deck, the romance of a dinner for two killed by the whiny kids at the next table or a cozy evening ruined by cramped cabins with minimal amenities. For our top picks, we looked at criteria that we would deem universally romantic: ships that offer cabins with private balconies, great bathrooms and extra-special amenities; options for dining a deux; cozy nooks and date-night venues; and almost-private open-deck spaces for relaxing by day and stargazing by night. Here are our favorite ships for celebrating or rekindling romance with your sweetheart. Why: The youngest of Princess' Grand-class ships -- Crown Princess, Emerald Princess and Ruby Princess -- blend big-ship options and small-ship cozy. Romance has always been the Love Boat line's focus, but the tiny, charmless balconies and bigger size of its newer Royal-class ships mean that the elder sisters still win in this category. 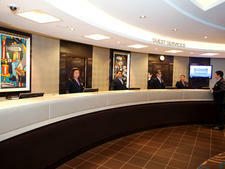 Sweet Digs: Each boasts the line's traditionally high percentage of suites and mini-suites. Suites feature separate sitting areas, large balconies and walk-in closets, and come with perks like evening canapes, a complimentary mini-bar setup, laundry services, use of the ship's thermal suite and complimentary dinner in a specialty restaurant on embarkation night. But even the standard mini-suite is charming and comfortable -- thanks to a fleetwide rollout of its new Princess Luxury Bed in all cabins. With pillow-top mattresses, Jacquard-woven cotton bed linens and fluffy duvets, you might be inspired to snuggle in bed a bit longer. Onboard Romance: What could be more romantic than a night at "Movies Under the Stars," reclining on padded loungers while snuggled under wool tartan blankets on the pool deck? Or for quiet tete-a-tetes with your sweetie, try Adagio, a lovely and private top-deck lounge. During the day, we love The Sanctuary, a (mostly) shaded retreat, complete with waiter service, spa menu and massage services (a couples' massage is available). Dinner for Two: Open-seating (as well as traditional) dining is available. 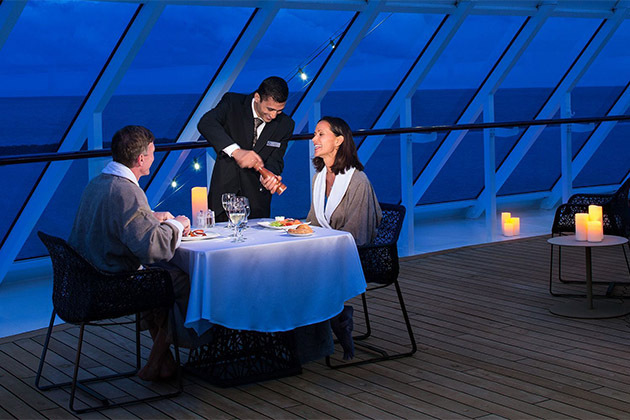 But the most romantic option is the Ultimate Balcony Dining dinner experience. 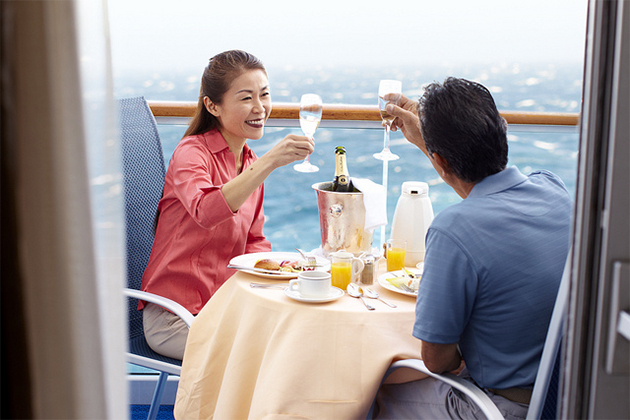 For an extra fee, cruisers are treated to a lobster dinner with Champagne and course-by-course service. 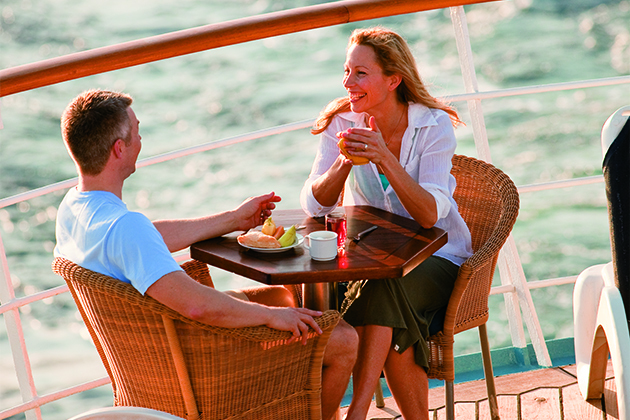 (Or have a romantic breakfast in your cabin with the line's Balcony Breakfast option.) Only caveat: Your cabin must have a balcony. We also love the ships' specialty restaurants. Request a banquette at Crown Grill, a steak and seafood restaurant with an open grill; indulge in a multicourse meal at the Italian Sabatini's; or share dishes with your sweetie at Share by Curtis Stone or The Salty Dog Gastropub. For a more casual option, try Vines, a wine and tapas bar. If chocolate is your aphrodisiac of choice, be sure to try the onboard cocktails and desserts created by master chocolatier Norman Love. Downside: While the deluxe mini-suites are lovely and comfortable, the all-open-air balconies are anything but private. Why: Designed, built and decorated to sail year-round in the romantic South Pacific, the cozy, 332-passenger Paul Gauguin offers an air of tropical festivity. 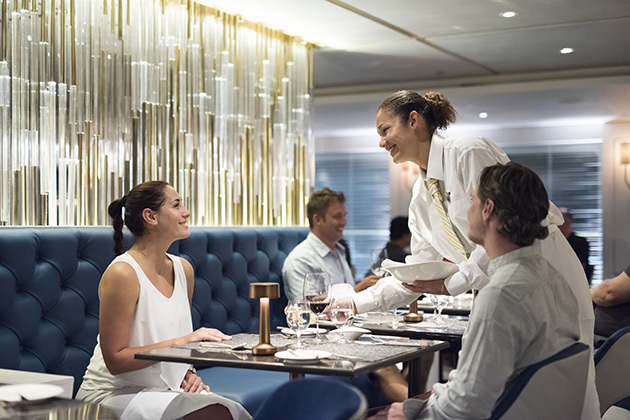 Dining is restaurant-style, the staff is superb and the ship is highly inclusive (cocktails and other beverages are included in cruise fares). But it's the ship's remote and lush island destinations that really turn up the notch on the romantic nature of the trip. Sweet Digs: You know this is a ship intended for couples when most cabins come with a queen-sized bed and only a limited number can be split apart into twins. Consistent with the decor around the ship, cabins are tropically inspired. When you embark, you might find that your cabin attendant has showered the bathroom sink with red rose petals. Definitely book ahead so you can nab a balcony cabin. It's not a trip to the South Pacific if you're not out on your balcony, savoring coffee, as Bora Bora pulls into view. And just when life onboard couldn't be any better, suites and category A and B veranda staterooms feature butler service. Onboard Romance: Dance cheek to cheek with your honey to the tunes of a chanteuse in La Palette Lounge, or gaze at the sea or stars from the lounge's top-of-ship vantage point. Dinner for Two: For such a small ship, the choice of restaurants is superb. L'Etoile, which offers French cuisine accented with Polynesian touches, serves as the main venue. Couples will appreciate plentiful tables for two and an attentive wait staff that will keep your glasses filled with house wines and nonalcoholic beverages. Two casual venues offer indoor and alfresco dining, with reservations-only dinners. And there's always room service for meals in bed or on your balcony. Downside: French Polynesia is a long trip from just about anywhere, so be prepared to endure hours on a plane before you get to your luxurious destination. Why: Wind Surf's both a sailboat and cruise ship, and it features a hybrid blend of cruise traditions (such as the crew show, organized shore excursions and multiple eateries) and utterly romantic vistas. Carrying just 310 passengers, the ship's onboard ambience is relaxed (no set seatings at dinner) and its itineraries focus on ports in the Caribbean, Mediterranean and Baltic that are often too small to appeal to massive ships. Sweet Digs: What Windstar's cabins lack in size and variety, they make up in style. 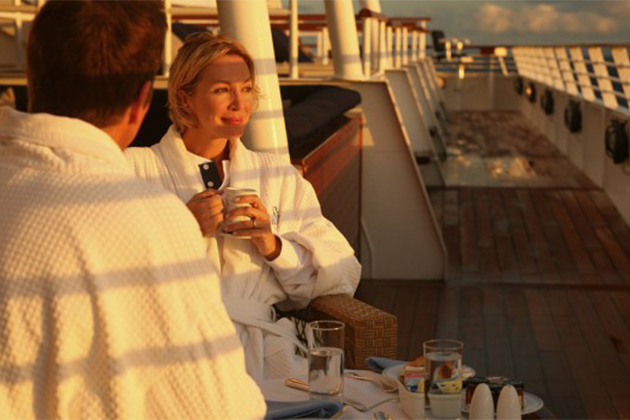 The staterooms offer decadently soft bedding, L'Occitane bath products and flat-screen TVs with DVD players. Most suites are simply two standard cabins opened up and joined together, but having two bathrooms is generally a boon for marital bliss. For a special occasion splurge, book one of two Bridge Suites, which feature separate living rooms and bedrooms, a whirlpool tub and a massaging shower. Onboard Romance: A favorite spot -- and it's remarkably quiet -- is at the outside tables at Wind Surf's cigar bar; it's a great place to sit under the stars (or enjoy a quiet cocktail). If it's too chilly for sitting outdoors, head to the indoor section of the Compass Rose lounge to listen to some pre-dinner music over drinks with your sweetheart. Dinner for Two: For casual daytime dining, the glass-walled Veranda offers seating outdoors as well as indoors. It's adjacent to the grill and features both buffet fare and choices from a menu. At night, enjoy a romantic candlelit dinner by the pool at Candles, sample French-influenced contemporary dishes at Stella Bistro or dine in the main restaurant, AmphorA, which features local and creative cuisine. Downside: This ship is small and cabins are close to the water, so in rough seas, you'll definitely feel the motion of the ocean and perhaps watch the waves close in over your porthole. If you're prone to seasickness, bad weather might kill the romance of a Windstar cruise. Why: Norwegian's "Freestyle Dining" philosophy (passengers can dine without the hassle of assigned times and tablemates at a variety of restaurants) is perfectly suited to table-for-two travelers. While the line's newest and biggest ships are full of Las Vegas flash and nonstop entertainment action, we prefer its Jewel-class for the right mix of romantic options and plentiful activities. Sweet Digs: If you can afford them, the ships' Haven suites -- Courtyard Penthouses, Owner's Suites and Garden Villas -- are tops for a romantic getaway. These suites are located away from the fray in a private-access area of the ship -and offer a host of special perks, from access to an exclusive pool area (complete with padded loungers and hot tub) to VIP-only breakfast and lunch in either Cagney's Steakhouse or Moderno Churrascaria. The suites feature separate living and sleeping rooms, flat-screen televisions, butler service and swishy bathrooms, some with a whirlpool tub set into a picture window alcove. Onboard Romance: Active couples can play a little one-on-one basketball on the sports deck or race each other up the rock climbing wall; while those looking to relax together can snag side-by-side loungers in the spa's relaxation room or take a dip in the thalassotherapy pool. At night, snuggle up to your honey, cocktail in hand, on one of the plush couches (on Norwegian Gem) or canopied beds (on Norwegian Pearl) that serve as loungers in the Bliss Ultra Lounge and Night Club; on Jewel and Jade, hit up Bar City to have your pick of multiple bars and drink styles. 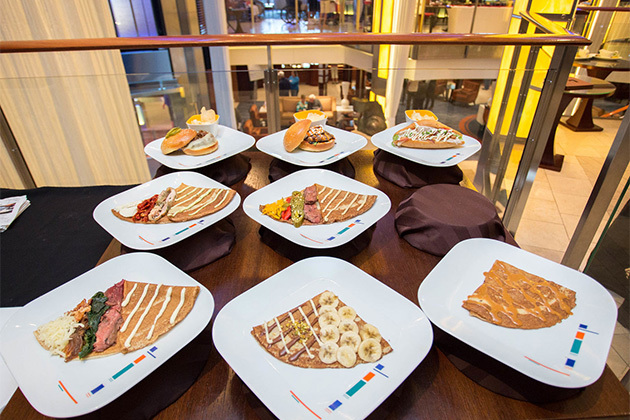 Dinner for Two: Try dinner at Cagney's, the dedicated steakhouse, and Le Bistro, a French eatery. Downside: These mega-ships aren't exactly intimate, and you might have to queue up for your dinner table for two if you don't eat at odd times or make reservations in advance. Why: These nearly identical 112-passenger yachts win top romantic honors for sophisticated couples who want luxury (phenomenal dining and great service) in a casual ambiance. The ships are gorgeously restored; dining is all as-you-wish; cabins, though cozy, are outfitted with everything you could possibly need; and service is outstanding, personable, attentive ... and subtle. Fares are all-inclusive, too, which means tips and most drinks are included in your fare. Choose a warm-weather itinerary if you want to spend time playing with the ship's water toys offered from its onboard marina. Sweet Digs: There are only four types of stateroom. The most romantic is, of course, the Owner's Suite (with a fabulous windowed bathroom); the Admiral Suite has similar amenities but is somewhat smaller. The Commodore Suites are basically two standard cabins put together -- we actually preferred our standard accommodations. The 195-square-foot standard cabins feature separate seating areas and bedrooms, with a small but exquisitely outfitted bathroom (huge shower-for-two with three shower heads). Add to that fine linens and great mattresses on the bed, high-tech flat-screen televisions, DVD and CD players, stocked mini-bars and plenty of storage space. Onboard Romance: Our favorite place for sunset-timed port departures was on one of the Balinese beds on the top-most deck. Tucked around the smokestack, they are built just a bit above the deck railing, which gives you a sense of floating above the water. (You can also reserve one for a night sleeping under the stars.) We also loved the Top of the Yacht bar for after-dinner drinks to a soundtrack of live music. Dinner for Two: There are two primary venues. The Main Dining Salon (indoors) feels like a restaurant at an elegant, small boutique hotel. But our favorite spot was the Topside Restaurant; it's an open-sided outdoor eatery (covered, though, so shaded) and there are a handful of wonderful and private nooks. Downside: There are no cabins with balconies, but the open decks are so expansive and there are so many lovely nooks that you'll never miss them. Why: Celebrity's newest ships are sophisticated and hip, and cater to couples on adult getaways, rather than families on holiday. Plus, there are plenty of onboard spaces tailor-made for parties of two -- from wine bars to multiple specialty dining venues, double pool loungers, top-deck lawns perfect for picnicking. On Celebrity Edge's Rooftop Garden, couples can snuggle up to the acoustic tunes of a live band. Sweet Digs: For a true splurge, suites range in size from 300 to 1,892 square feet, with amenities such as separate living room/dining room areas, baby grand pianos, whirlpool tubs and large balconies. For couples who enjoy the spa experience, Celebrity's AquaClass cabins and suites create an oasis of calm on the bustling ships with massaging showerheads, complimentary spa-oriented bath and body products and upgraded bed linens. Plus, couples can seek further R&R with complimentary use of the AquaSpa Relaxation Room and Persian Garden and exclusive specialty restaurant, Blu. There's also good news for pairs looking for a private retreat without breaking the bank -- 85 percent of all cabins feature private balconies. Celebrity Edge's Iconic Suites even have their own private hot tubs on the balcony. Onboard Romance: It's easy to rekindle the romance with a picnic for two in the Lawn Club, a real grass lawn on the ships' top decks. Or hide away in a corner of the Deck 4 wine bar or martini bar, and get a little tipsy with your loved one; the aft Sunset Bar is great for views. The pool deck and adults-only Solarium also have cozy double sunbeds and hammocks for snuggling in the sun. Dinner for Two: With so many top-notch specialty restaurants onboard, any table for two will do for a romantic night out. Our favorite for couples (and anyone else, for that matter) is Murano, the upscale Continental restaurant offering both tasting and a la carte menus. Treat yourself and your sweetie to luxe dishes like caviar, escargots, sweetbreads or foie gras. For dinner with a view, dine early at the back-of-the-ship Tuscan Grille, an Italian steakhouse with a wine country feel. Downside: Onboard dates don't come cheap, whether you're shelling out for glasses of wine or fabulous cocktail creations, splurging on a specialty restaurant meal (Murano charges $45 per person) or booking upper-class cabins. Why: You can't go wrong with the "Most Luxurious Ship Ever Built," an all-suite, all-balcony vessel that features personal service, gourmet cuisine and the most-inclusive cruise fares of the major luxury lines. You don't have to worry about lover's quarrels over the price of shore excursions, which pre-cruise hotel to book or how many drinks to order -- it's all covered by your cruise fare. Sweet Digs: Take your pick! The smallest cabin on Explorer is a 219-square-foot suite with an 88-square-foot balcony and marble bathroom. The largest is a whopping 2,917 square feet and features a luxurious bed with topped with a $90,000 horse-hair mattress and $60,000 bed linens; an in-cabin spa complete with private sauna, heated ceramic lounge chairs and unlimited spa treatments; and a 958-square-foot balcony -- with a hot tub, dining table and assortment of loungers -- that wraps around the entire front of the ship. 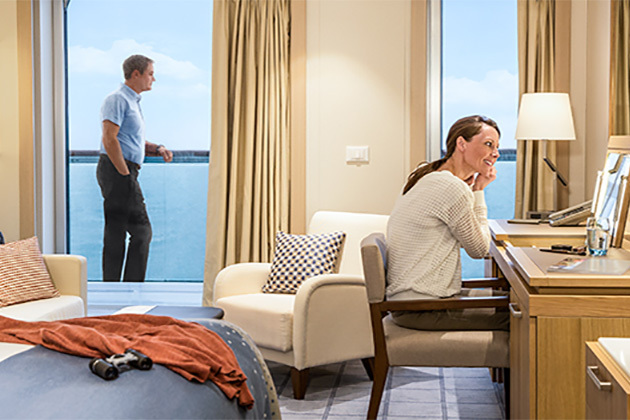 If you want to spoil yourself but can't quite afford the ship's top suite, know that all Penthouse Suites and higher categories come with butler service, upgraded toiletries and free use of iPads and iPods onboard. Onboard Romance: Head to the gorgeous spa and gym area to get a little sweaty together (personal training for two?) 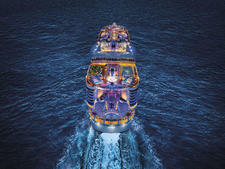 and then relax in the back-of-ship infinity pool or heated ceramic loungers. Or visit the Observation Lounge for 180-degree views by day and cocktails and music by night. If you like learning together, sign up for a cooking class at the Culinary Arts Kitchen. Dinner for Two: It's easy to get a table for two on these ships, even in Compass Rose, the main dining room. And the food is superb, with no drop in quality from the specialty venues to the main dining room. For date night, try the pan-Asian Pacific Rim, modern French Chartreuse or the Prime 7 steakhouse -- you'll need to make reservations for these popular venues but there's no fee. Downside: Because its prices include nearly everything, Regent Seven Seas Cruises has some of the highest cruise fares in the industry. Why: If you want to sample the high life, where days are spent lounging on a day bed in the sun with a drink in hand, swimming and snorkeling or touring the more yacht-y ports, Crystal Esprit beckons. The 62-passenger yacht is also incredibly high-tech, carrying Jet Skis and a three-person submersible; cabins loaded up with state-of-the-art technology; and even an outdoor flat-screen TV for movies under the stars. Sweet Digs: Most cabins are identical and a generous 280 square feet so you won't feel like you're tripping over your honey on a small ship. Rooms come outfitted with high-tech touches, such as a Soundbar speaker system, iPads for accessing ship services and flat-screen TVs loaded with movies. Enjoy the services of a butler, a stocked mini-bar and Krups coffee maker, king-sized bed and even a rain shower in a spacious bathroom. For truly special vacations, snag the one Owner's Suite onboard, which has separate living and sleeping areas and an egg-shaped soaking tub in the bathroom. 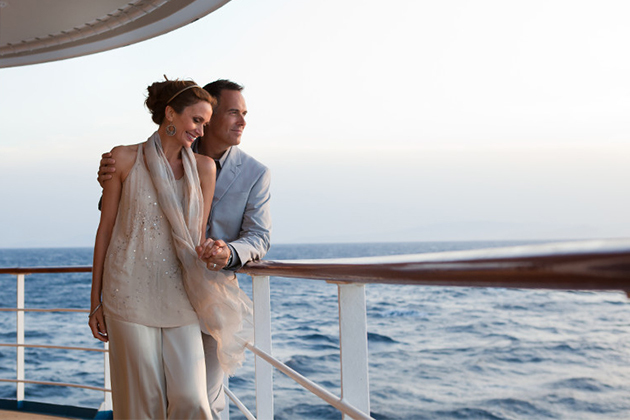 Onboard Romance: Most passengers are splashing in the water or enjoying complimentary tours during the day. If you're onboard, you're likely to be found cuddling on a Balinese bed or dipping your toes in the plunge pool. At night, catch a flick on the outdoor screen, or get social in The Cove, the ship's living room with live music and bar service. Dinner for Two: The elegant Yacht Club Restaurant is the only dinner venue onboard. You won't have trouble snagging a table for two and will be spoiled for choice with a regular menu and special four-course menu offered each evening. For total privacy, order room service off the Yacht Club's menu and take date night back to your cabin. Downside: Crystal Esprit offers port-intensive itineraries, so if you're looking for sea days, you won't find them. The yacht uses Zodiacs to tender, with some wet landings, and rocks and rolls when not in sheltered waters. If you have mobility issues or are prone to seasickness, the romance might be lost rather than found on this small ship. Why: Azamara offers three, nearly identical, intimate ships and a destination focus, so you can bond with your loved one over new experiences and incredible adventures ashore. 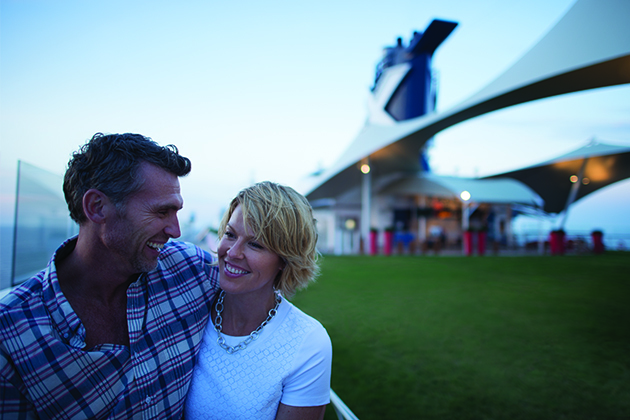 The line will constantly hand you opportunities for memorable date nights with its Nights and Cool Places after-dinner excursions and complimentary, once-a-cruise AzAmazing Evening shoreside event. The onboard atmosphere is geared to adults, so your vacation-for-two won't be disrupted by unruly rug rats. Sweet Digs: Standard cabins are pretty cozy, but Azamara's suites offer more luxury and elbow room. The most sought-after are Ocean and World Owner's Suites, which command the fore and aft of the cabin decks. Think king-sized beds, marble baths and enormous private balconies. If the two of you love the spa life, book a Spa Suite, located near the ship's spa facilities; the suite comes with in-room spa music, a glass-enclosed soaking tub and separate rain shower, a free evening excursion and a spa credit. Couples massage, anyone? Onboard Romance: Take your partner for a whirl with ballroom dancing in the Cabaret Lounge, or look for that green flash at the Sunset Bar on Journey and Quest, cocktail in hand. 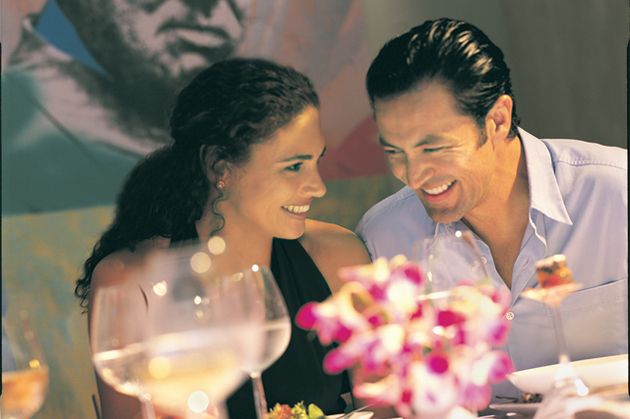 For the ultimate in romance, though, book the Nights in Private Places package. For one night, you'll get the aft spa deck all to yourself. A private butler will serve a candlelit dinner, you can float in the thalassotherapy pool while gazing at the stars, and then spend the night snuggled up on the canopied daybed, done up in fine linens. Just be sure to slip your robe back on when the butler comes to serve breakfast in the morning. Dinner for Two: Tables for two are not hard to come by in Azamara's main, open-seating restaurant, but for a more intimate repast, book into one of the specialty restaurants, the Prime C steakhouse or the Italian Aqualina. Special event meals not to miss include a jazz brunch, Officers' BBQ with suckling pig and barbecue ribs and the White Night dinner served on deck. 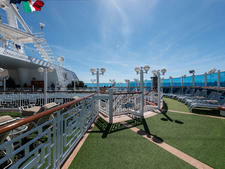 Downside: If you like onboard nightlife, Azamara's options are limited. The casino is small and theater offerings are hit and miss. You won't find a packed disco or dancing well into the wee hours. Why: With beautiful sun decks and a huge Nordic-inspired spa, Viking Ocean's four identical ships are ideal for couples who love to relax...after a hard day of touring in port. The line's destination focus includes jam-packed itineraries, late nights and overnights in port and included shore excursions. Well-appointed cabins, included Wi-Fi and wine with meals, multiple dining venues and a no-kids-under-16 policy seal the deal. Sweet Digs: You can't go wrong when every cabin has a balcony, thoughtful touches like plentiful outlets and quiet-closing drawers, and bathrooms with heated floors. Upgrade to one of 14 Explorer Suites for sprawling verandas, separate living rooms and bedrooms and soaking tubs in the bathrooms. If nothing but the best will suit your sweetheart, book the one Owner's Suite with its private sauna, dining area and wet bar, and comfortable living room with stereo system. Onboard Romance: During the day, relax in the light and airy, glass-enclosed Wintergarden Conservatory and take your honey to tea for finger sandwiches and scones in the late afternoon. Or lounge by the all-weather main pool, with retractable roof, or aft infinity pool. A cool drink is never far away. At night, camp out in Torshavn, to dance, enjoy a cabaret show or sip Armagnac in a dark corner. Dinner for Two: The mouth-watering food at Manfredi's will start your date night off right. The Italian venue is complimentary and offers an expansive Italian menu. Don't miss the daily specials and definitely save room for dessert (as difficult as that might be). If your style is more casual, check out the sushi bar in the World Cafe buffet or the cured meats and bacon-and-pea soup served faux-fireside at Mamsen's. Downside: All that running around in port can you leave you exhausted, with little energy for romance at day's end. Be sure to factor in some relaxation time with your special someone, but expect limited entertainment onboard (day and night) and no casino.